California Gov. 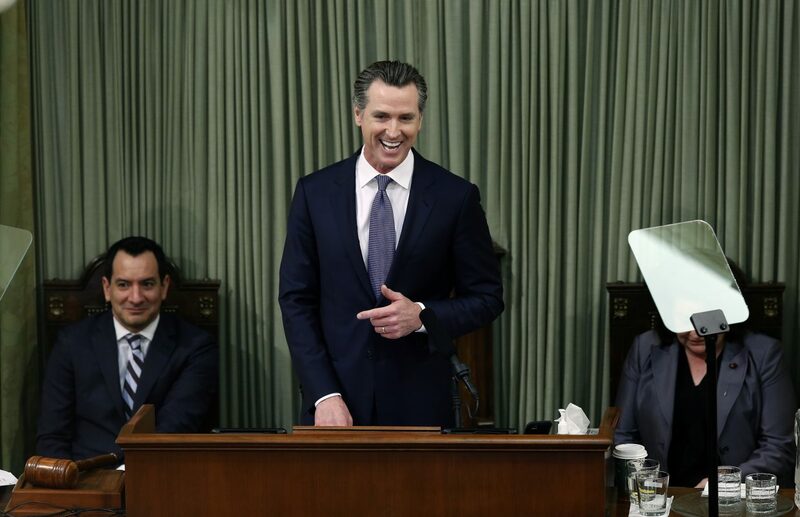 Gavin Newsom delivers his first state of the state address to a joint session of the legislature at the Capitol Tuesday, Feb. 12, 2019, in Sacramento, Calif. Newsom was flanked by Assembly Speaker Anthony Rendon, D-Lakewood, left, and Senate President Pro Tem Toni Atkins, D-San Diego. SACRAMENTO, Calif. — California Gov. Gavin Newsom said Tuesday he’s abandoning a $77 billion plan to build a high-speed rail line between Los Angeles and San Francisco and will focus instead on completing a 119-mile segment in the state’s agricultural heartland. Voters approved a ballot measure in 2008 calling for the linking of Northern and Southern California, a rail project initially estimated to cost $33 billion and be completed in 2020. Subsequent estimates more than doubled the cost and pushed the timeline to 2033. Newsom pledged to finish the segment already under construction through California’s Central Valley. He rejected the idea critics have raised that it will be a “train to nowhere” and said it can help revitalize the economically depressed region. While that construction continues Newsom said the state will conduct environmental reviews on the entire Los Angeles to San Francisco route and push for more federal and private money to connect the valley to the state’s economic powerhouses, though he didn’t say how. “Right now, there simply isn’t a path” to complete the full line, said Newsom of the plan championed by his two predecessors, Arnold Schwarzenegger and Jerry Brown. Newsom also replaced Brown’s head of the state board that oversees the project and pledged more accountability for contractors that run over on costs. His remarks on high-speed rail came during his first State of the State as governor of the nation’s most populous state. During the address, he said the state faces “hard decisions that are coming due” on clean water, housing and homelessness. Newsom rebuked President Donald Trump again on border security after saying Monday he will withdraw most of the state’s National Guard troops from the Mexico border. Brown had agreed to deploy troops last year at the Trump administration’s request, although he said they couldn’t participate in immigration enforcement. Newsom, though, said there’s been a “gray area” in the troops’ duties that may have allowed some to inadvertently participate in immigration activities. A Guard official said the state’s troops have not helped detain anyone. Newsom’s speech also detailed his ambitious policy goals for the state. He announced the creation of the new Commission on Homelessness & Supportive Housing to address what he said is a moral issue that has become a public health crisis. His administration recently sued the Orange County city of Huntington Beach, accusing it of not meeting its affordable housing goals. Newsom also promised to have a plan within 60 days for dealing with the recent bankruptcy filing by Pacific Gas & Electric Corp. after years of devastating wildfires. He said he has convened a team of the nation’s best bankruptcy lawyers and financial experts from the energy sector to work with his administration to develop a strategy to protect the state’s power grid, wildfire victims, company employees and ratepayers. He also promised to address the pressure that climate change is putting on utilities.